SIP ALG ( Application Layer Gateway) is a feature on many routers that attempts to negate the need for static NAT mapping. Unfortunately, the implementation of SIP ALG's varies from manufacturer to manufacturer, and it generally causes more issues with VoIP (specifically SIP based VoIP) than it helps to alleviate. The vast majority of the time the SIP ALG will need to be disable and typical port mapping will need to be implemented. A fair amount of devices ship with the SIP ALG enabled by default, and some even prevent the user from being able to disable the ALG or require a-typical access to do so. The implementation of a SIP ALG has the affect of modifying SIP packet headers and hence affects SIP calls and/or the associated audio. Note: Some of the symptoms above can be caused by other configuration and/or technical issues and may not 100% indicative of a SIP ALG issue. This section is designed to give you an idea of how to disable the SIP ALG on various brands and/or models of routers. It is not comprehensive and is routinely updated as routers and their software/firmware implementations consistently change and models are added/removed from production. If you have questions about your specific device please contact support. 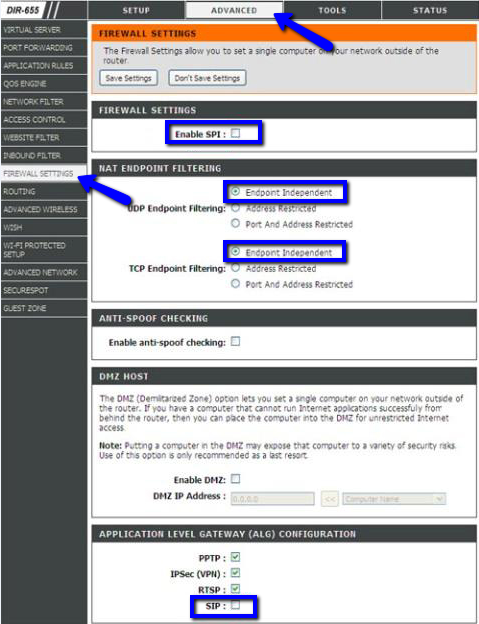 Netgear devices typically ship with the SIP ALG enabled. To disable you will need to do the following. SonicWALL refers to their SIP ALG as 'SIP Transformations', quite a few of the devices have shipped with this feature enabled in the past. 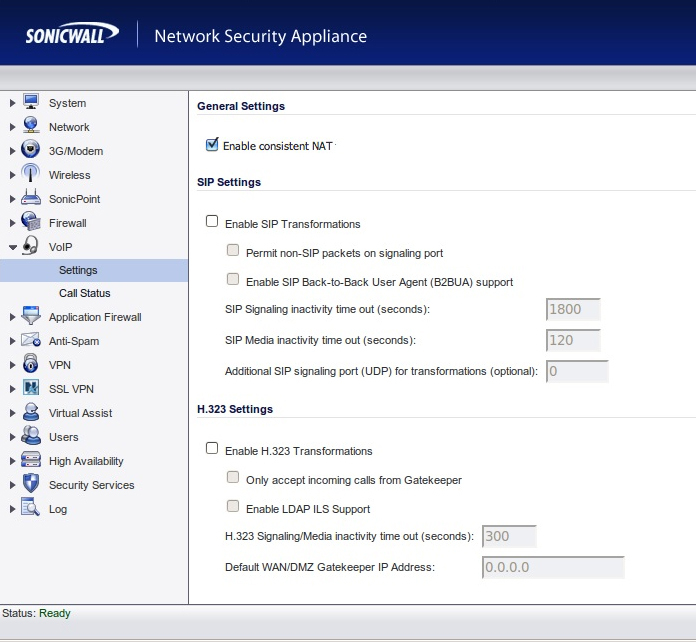 Most SonicWALL devices will also require the UDP session timer to be increased from 30 to at least 60, if not 120 or 180 seconds. Cisco devices refer to the SIP ALG as 'SIP Fixup' and require access to the command line (CLI) of IOS to disable. There are a couple of steps to disabling a SIP ALG on a D-Link device. After that has been set, find the 'Application Level Gateway (ALG)' configuration near the bottom and uncheck the 'SIP' field as shown below. Login to the Fortigate device, and access the Fortigate CLI from within the dashboard. Older versions of Asus firmware typically only support disabling the SIP ALG via the command line interface. 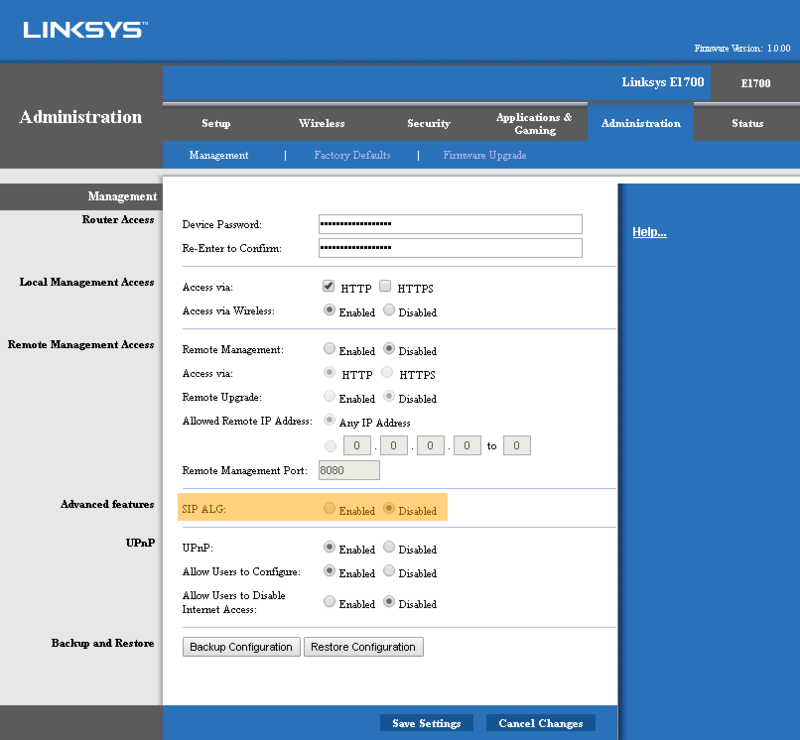 If you do not see the option to disable the SIP ALG in the GUI, check to see if your router has a firmware update. The RV042 will not work with firmware versions older than version 1.3.12.6 or possibly version 1.3.12.19. Update to the latest firmware available for this device and it should function properly. The DG1670A runs the same firmware as the DG860A with the additional capability of disabling the SIP ALG. Even with the SIP ALG disabled (as shown below), field reports indicate that a UDP session timer issue remains, which will continue to cause issues. The Actiontec GT784WN & GT784WNV both have a SIP ALG that cannot be disabled from the HTTP administrative interface or from telnet. 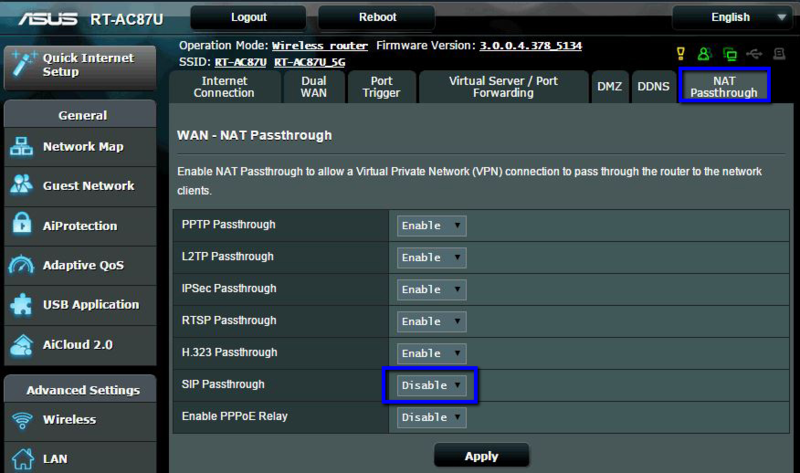 The issues with these devices are further compounded by the fact that the firewall, when set to the 'NAT only' setting, intermittently blocks keep alive messages from various devices. Our recommendation to utilize the GT784WN or the GT784WNV is to set it in bridge-mode and implement a SIP compliant router behind it (use it only as a gateway). Peplink devices support SIP ALG across their entire product family and it is enabled by default. To disable the SIP ALG on a Peplink device, you will need to set the SIP ALG to 'Compatibility Mode' under Network → Service Passthrough Support → SIP in the WWW GUI of the router.